It’s Spring! I love this time of year when the weather starts getting warmer, the sun starts shining more and winter is becoming a distant memory. I find I’m gravitating to all things light and bright. I’ve shed my all black/grey winter wardrobe and I’m loving this seasons lilac/rose/smokey blue color palette. I’m also gravitating to lighter meal options. 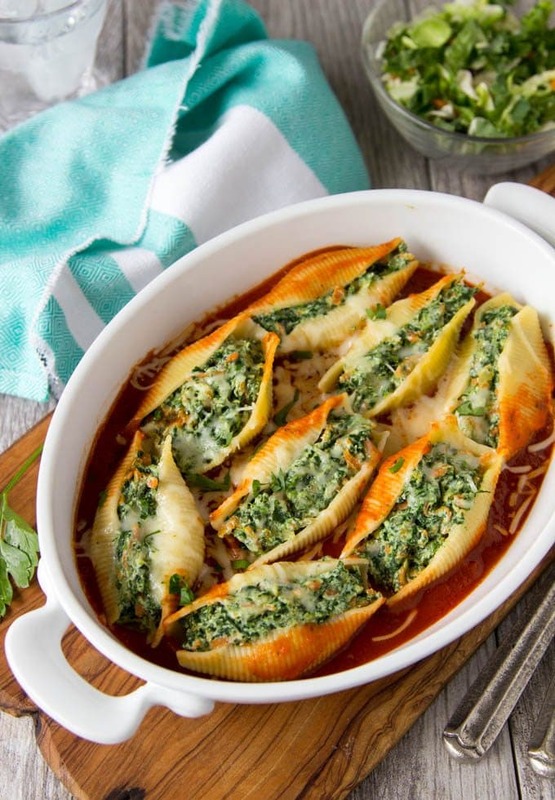 Like these Spinach and Cheese Stuffed Pasta Shells. It’s still comfort food (hello! pasta, gooey cheese and tasty tomato sauce)…but a lighter version. These baked stuffed pasta shells are perfect for Spring (or anytime you want a lighter pasta meal). 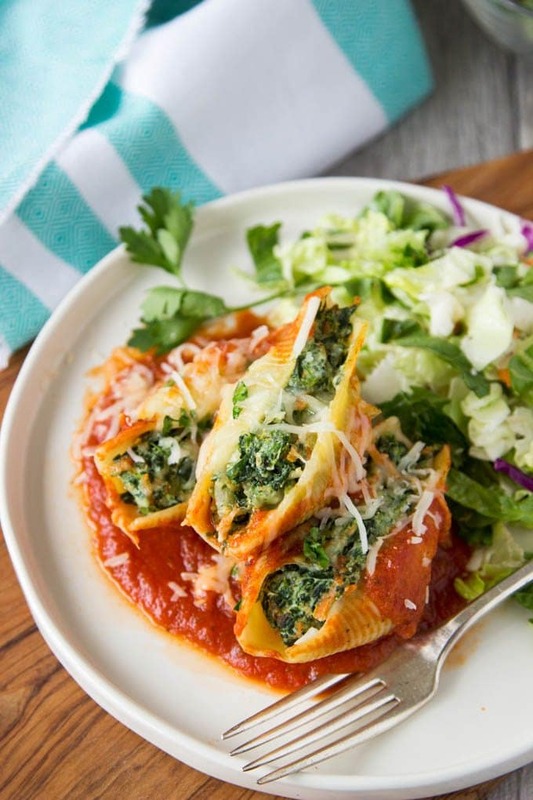 Each pasta shell is stuffed with lots of healthy veggies like spinach, zucchini and carrots . Mixed with ricotta cheese and just a bit of melty Italian blend cheeses because, well…pasta just needs some melty stringy cheese that stretches from your plate to your fork. The filling part (as in fill your belly with nutritious food) is the filling (as in the tasty medley of veggies that are stuffed into each pasta shell). A majority of what you are filling up on are veggies! 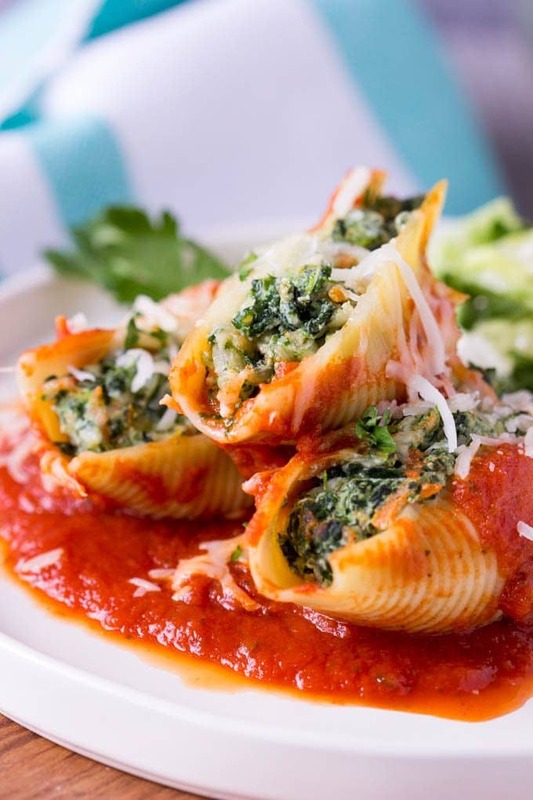 Mixing the veggies with ricotta cheese and covering with marinara sauce (or your favorite pasta sauce) means these stuffed pasta shells taste like little bites of lasagna, but with a whole lot less noodles (which means fewer calories). The beauty of using pasta shells is that you can tailor the quantity to fit your needs. You can scale this recipe to serve one or two or make enough for a big party. Some veggie ideas : besides zucchini, onions, spinach and carrots ..cauliflower (I would put it in the blender to make “rice” consistency – you can read about that here) peas, asparagus, squash, mushrooms, corn etc. You can change the vegetables you use based on what’s in season. In a large saucepan, bring water to boil and cook pasta to al dente according to package directions (approx. 8-9 min.) ;drain. Rinse pasta in cold water;drain again. While pasta is cooking, in a large skillet over medium-high heat, add olive oil ; cook carrots, zucchini and onions until tender(approx 3-5 min.). Stir in spinach and cook an additional 1 minute , stirring frequently. Transfer spinach mixture to a large bowl. Add ricotta cheese, ½ of the shredded cheese and salt to spinach mixture. Pour 1 cup marinara sauce in the bottom of an ungreased 8x8 baking dish. Spoon spinach/ricotta mixture into each shell (approx. 2 rounded tablespoons per shell). 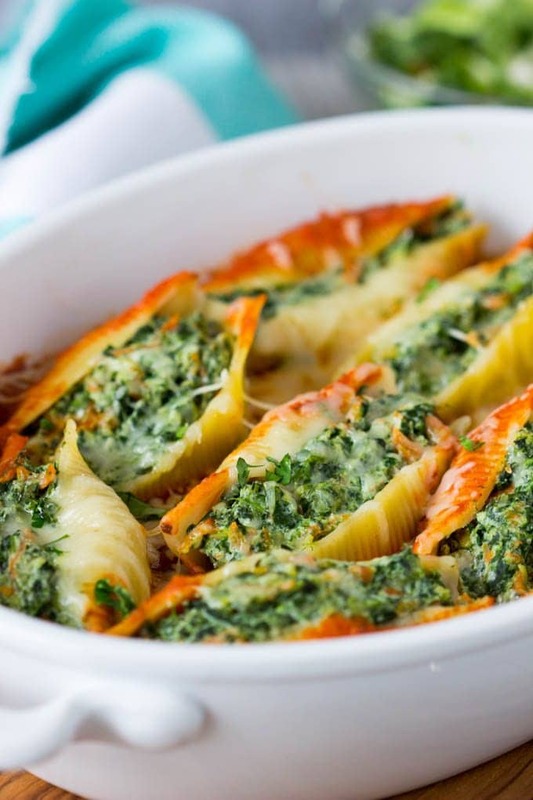 Arrange stuffed shells over sauce in baking dish. Pour remaining sauce over top of shells.. Cover with aluminum foil. Bake until bubbly (approx. 20 min) Add remaining cheese, recover with foil and cook until melted (approx. 10 min). Serve and garnish with chopped parsley, if desired. recipe adapted from BHG Veggie-stuffed Pasta Shells (Skillet Dinners 2016) -link is to BHG, I don’t see the recipe online anywhere yet. If it’s stuffed with cheese, you can count me in! This looks like absolute perfection!